Original Image by Joel Dinda, used under Creative Commons. Edited with Pixlr Express. Aaron Small has one of the best baseball stories you'll hear. It took him sixteen years bouncing back and forth between the minor leagues and multiple Major League teams to finally find success at the Major League level. Whenever he'd start to find success, injuries and front offices would set him back. When he did finally get a real shot, he won his first ten games as a pitcher in Major League Baseball for the New York Yankees. Although he was out of Major League baseball after a poor season in 2006, it was still quite a rollercoaster of a career. 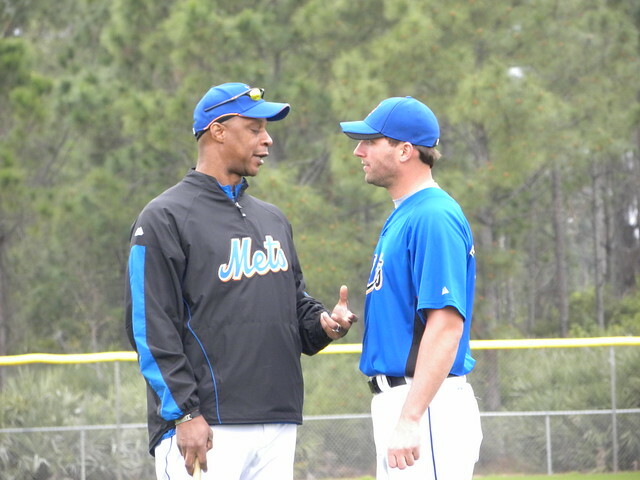 Small was drafted in the 22nd round by the Toronto Blue Jays in 1989. He would get into one game for the Blue Jays in 1994, after a decent season in the minors. In that game, Aaron gave up two runs, including a home run, in 2 innings. He'd be traded for a player to be named later to the Florida Marlins. His 1995 minor league season, exclusively out of the bullpen, was another good one. He actually enjoyed some success in 7 games for the Marlins, but he walked 6 batters in 6 innings, which demonstrated control issues, The Marlins would put him on waivers, where the Oakland Athletics would pick him up and give him another shot. Small's next Major League chance came after a 1996 season in which he mostly started games. While his ERA wasn't great (4.29), his control had improved, 83 strikeouts to only 28 walks in 120 innings. These peripheral stats prompted Oakland to give him a major league chance. He bombed as a starter in 3 games, but regained himself as a reliever. To Oakland's credit, they gave Small another chance in 1997! Besides one successful minor league start, Small spent the year in the Oakland bullpen as a mop-up man. While he was at the back of the bullpen, he got into 71 games and pitched 97 innings. His control issues returned, with 40 walks to 57 strikeouts. Still, he was effective enough to provide 1.3 Wins Above Replacement of value while eating some innings. That is nothing to sneeze at. The 1998 season is when the rollercoaster really got started. He bombed for the A's to the tune of a 7.24 ERA in 24 games. He was put on waivers, and the newly formed expansion team Arizona Diamondbacks picked him up. Once again, he found his 1997 form and was decent in 23 games. His 8 walks in 32 innings were acceptable. He was worth 0.3 WAR to them, after being "worth" -0.9 WAR to Oakland. Then, he bombed in Spring Training for the Diamondbacks and was released. He wouldn't taste the Major Leagues again until 2002. Injuries and ineffectiveness would plague him during that time. He bounced between the minor league teams of the Milwaukee Brewers, Tampa Bay Devil Rays, Anaheim Angels, and Atlanta Braves. There was a ray of hope in 2001, though. After bombing with the Angels' AAA team, the Atlanta Braves gave him another chance as a relief pitcher, and he did well. While he didn't make the Majors, the Braves gave him another shot in 2002. Injuries destroyed his season and he floundered yet again as a starter. Returning to the pen, he showed enough to get into one Major League game for the Braves. He gave up two runs in one-third of an inning, while walking two. So, after being let go by the Braves, he caught on with the Cubs. But he was cut at the end of Spring Training. Fortunately, the Florida Marlins came calling. They wanted to use him as a starting pitcher. While he was knocked around in the hitter-friendly Pacific Coast League, some success at AA, and very solid walk-to-strikeout numbers prompted the Marlins to keep him around in 2004. He had a better season, but when he got his Major League callup, he lost his pitch control once again and bombed. Would he get another chance? Fortunately, yet another team, the New York Yankees, saw some promise. He would start out at AA in 2005 for the Yankees and move up to AAA. His ERA wasn't good at all, 4.83 between the two stops, but his strikeout-to-walk ratio was solid: 24 strikeouts to 9 walks. The Yankees gave him a spot start on July 20th. He was OK, allowing 3 runs in 5 1/3 innings, and picked up the win. His next game was out of the bullpen on July 23, and he pitched a scoreless inning. His success was about to begin. The Yankees gave him another start on July 28. He gave up 3 runs again, but this time pitched seven innings, and picked up another win. Although he struck out only a single batter, he walked none and scattered six hits. On August 5, he pitched an even better game: 6 2/3 innings allowing only 1 run on 7 hits and 2 walks. He only struck out 2 batters, but pitched out of trouble on multiple occasions. He won that game. However, the next start on August 10th was his best yet. He struck out seven batters in seven innings, allowing only a single run With only four hits and two walks, Small's command of the game was clearly improving. Small's next four games would be out of the bullpen. He would pick up the win in the first of those four by pitching a scoreless inning. His next game would actually be his worst yet, blowing a lead after a poor inning. The Yankees inevitably lost that game, although he wasn't charged with a loss. He followed that up with a rather poor outing in 2 2/3 innings, allowing 2 runs on 5 hits and a walk. However, the Yankees won that game. The fourth of those games was actually in relief of an uncharacteristically bad outing from Mike Mussina. Small pitched OK in four innings, although he gave up 3 walks and a hit, but no runs. He would earn the win in that game as the Yankees came back and won. Small's season only got better from there. His next start was a complete game shutout! His next three starts weren't that great, allowing 4 runs in two of them and 5 runs in another. However, the Yankees offense exploded for a total of 29 runs in those games, so he won them all. This gave him 9 wins on the season, out of nowhere. His second to last start of the season was a bit sad for Small, because he pitched brilliantly for 6 2/3 innings without allowing a run. But after walking none, giving up only four hits and recording three strikeouts, he pulled from the game. The Yankees went on to lose the game 7-4. Small's final start of the 2005 season was a mixed bag. He only gave up 2 runs, but allowed 5 walks and 4 hits, including a home run. But four strikeouts and a little bit of luck allowed him to win that game, too. He finished the season with 10 wins. However, the season wasn't actually over for the New York Yankees. Aaron Small would get one more appearance: Game 3 of the American League Division Series. Unfortunately, it wasn't a good one. He'd follow an ineffective Randy Johnson out of the bullpen and gave up the 2 runs that proved to do in the Yankees in Game 3 against the Angels – taking the loss. The Angels would go onto win that series. It wasn't really Small's fault that they lost the series, but it was a sad way to end what was a magical season for him. The good news for Aaron Small, however, was that his 2005 efforts would be rewarded. He would earn $1,200,000 for the 2006 season. This was big money for someone who'd spent most of his career in the minor leagues and had endured financial hardship on numerous occasions. Small's 2.7 WAR in only 15 games was incredible, the same amount of value that an above-average Major League pitcher would offer a team in an entire season of work. That looked to be an immense bargain for the Yankees, but it was more money than Small had ever seen in one place. It was good timing for that payday, too, as 2006 would be Small's last in the Major Leagues. A mix of ineffectiveness and injuries would spell the end of Small's baseball career. He would be "worth" -0.7 WAR. He would start only 3 games for the Yankees in 2006 and only 11 total games. Aaron would never win another game in the Majors, although he would have a couple of decent starts in 2006. Small would be designated for assignment and spend the rest of his season in AAA. Small would be nearly as bad in his 8 starts and 3 relief appearances in the minor leagues, as well. He would be released by the Yankees after the season. Before the 2007 season, the Seattle Mariners did give Small a minor league contract with a big league invite to spring training. But it didn't work out, and Small hung it up for good. His big league "field of dreams" baseball story is definitely one worth telling. But then, in 2009, Small had an even better story when he miraculously recovered from a near-fatal case of encephalitis. He was in a coma for eight days. It was so bad that he had to learn to walk again. Miraculously, he would recover and be able to live a full life! A devout Christian, Aaron Small would tell you that his Christian wife, Macy, and God were his greatest benefactors throughout his career. He likely also believes that it was divine intervention that saved his life in 2009. Whether or not you believe in the power of prayer, his wife's support and his faith in his own abilities as a pitcher definitely were major factors in his eventual success. The goodwill of the Yankees fans that watched his incredible 2005 season probably helped, too Many of them turned up at the last Old Timer's Day at the Old Yankee Stadium to cheer for him. His rollercoaster career, flash-in-the-pan, and return to life are definitely things worth cheering for! After baseball, Aaron Small became a leader at the Fairview Baptist Tabernacle in Sweetwater, Tennessee. He and and his wife minister to students. It's no surprise that he's remained devoted to his faith and family. He's a good guy who finally got rewarded for all of those years playing the game he loved. Aaron, we wish you and your family well! Happy birthday to the Giants pitching coach Dave Righetti! At one time, he was an above-average starting pitcher for the Yankees before being switched to the bullpen full-time in 1984. He was even better as a closer, racking up over 12 Wins Above Replacement (WAR) between 1984-1988. After that, however, he was never really the same pitcher, never again posting 1 WAR in a single season. Righetti signed a 4-year, $10 million deal with the Giants after the 1990 season, but never really lived up to it. After an effective 1991 season, he was just never an elite bullpen arm again. He did have a decent swan song in 1995 as a long reliever for the Chicago White Sox. He's been the Giants pitching coach since 2000 and doesn't appear to be leaving that role any time soon.